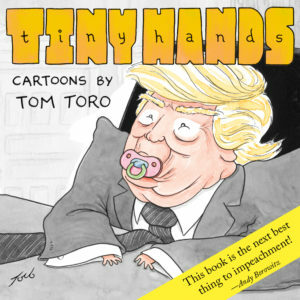 My new book of Trump cartoons TINY HANDS is available for pre-order! Buy it now before he’s impeached. The Huffington Post wrote an article about my Trump-Nixon cartoon and its role in the growing sense that we’re careening toward another Watergate. Late Night with Seth Meyers dramatized one of my X-Mas cartoons! Career highlight alert: my cartoon was chosen by @sethmeyers to be performed live by the @latenightseth players! They nailed it. The whole segment including other cartoonists’ work brought to life can be seen here. A Trump cartoon of mine is part of the online exhibition Unnatural Election, where artists from around the world respond to our political crisis. Bob Mankoff’s autumnal Cartoon Lounge episode features my leaf blower cartoon. Some of my best original cartoon art is being auctioned at Swann Galleries TODAY Thurs 9.29 at 1:30pm EST! The September issue of The Harvard Business Review features a new cartoon of mine. The original artwork for several of my NYer cartoons will be auctioned at Swann Galleries on September 29, 2016, along with pieces by Charles Addams, William Steig and Dr. Seuss. I have two cartoons featured in the Society of Illustrators Comic & Cartoon Art Annual exhibition – “God’s Reading Light” and “Fly Fisherman.” They’re framed and fancy and in a freakin’ gallery! Show open from May 3 – June 11, 2016 in NYC. My Trump cartoon makes a brief cameo in this episode of The Cartoon Lounge. A cartoon of mine is featured in the May 2016 issue of The Harvard Business Review. I did an interview with the Center for Biological Diversity and created an original cartoon for their Pop X program. TNY editor’s picks for the best cartoons of 2015 is out, including a modest offering from yours truly. It’s been brought to my attention that a cartoon of mine is featured in TNY’s Readers’ Favorites slideshow. I’m the latest cartoonist to be interviewed on the wonderful blog A Case For Pencils. The original artwork for one of my most popular cartoons is being auctioned at Paddle8.com until Oct. 27th. Our local TV news station was so excited about my KC Royals drawings they came to interview me on camera. I drew a series of baseball sketches for The New York Times covering the Kansas City Royals. View the slideshow. A writer at The Atlantic, James Fallows, considers jumping ship to The New Yorker based on the strength of one of my cartoons. Curious which? Read the article here. In an episode of The Cartoon Lounge, Bob Mankoff uses a rejected pitch of mine to discuss why “meta” cartoons aren’t often published in The New Yorker. Bittersweet, but somehow flattering. Have a look-see.